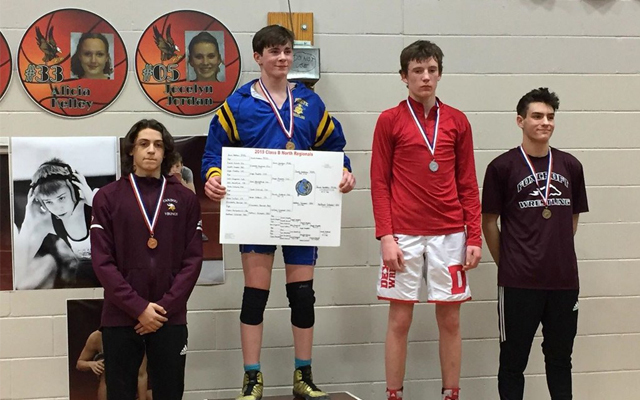 Sophomore Angel Riopelle was Caribou’s lone qualifier for this Saturday’s Maine Principals Association Boys State Wrestling Tournament after placing fourth in the Class B North regionals held at Ellsworth Feb. 9. ELLSWORTH, Maine — Sophomore Angel Riopelle was Caribou’s lone qualifier for this Saturday’s Maine Principals Association Boys State Wrestling Tournament after placing fourth in the Class B North regionals held at Ellsworth Feb. 9. Riopelle, who now has 22 wins on the season, entered as the No. 5 seed in the 145-pound weight division and defeated No. 4 Josh Hesseltine of Mattanawcook by pin. Jacob Nadeau of Piscataquis, who ended up taking first in the division, then won by fall over Riopelle. In the consolation semifinals, Riopelle recorded a third-period pin over Wyatt Staples of Belfast to reach the finals and guarantee his spot in the state finals. Foxcroft Academy’s Jacob Ireland defeated Riopelle in the consolation finals by an 8-2 decision. Rylee Saucier, getting ready for the first MPA girls’ state tourney to be held at Penobscot Valley High School in Howland Feb. 20, picked up a win over Isabel Lamb of Washington Academy before losing to PCHS’s Nate Bock in a 6-5 decision. She has 19 victories this season and will attend the state tourney in Lincoln as an alternate in the 113-pound division. Kaden DeMerchant, competing in the 160 division, went 1-2 on the day, with his win coming by pin over Calais’ Zac Grower. It was DeMerchant’s 22nd win of the season, tying him with Riopelle for the team lead. Mia Thibodeau in 160 and Chloe Kirschmann in 220 also will represent Caribou in the upcoming girls’ tournament.